Nice find so whoever it is she finds she is very surprised to see them alive, I'm really starting to think this is Kenny. Might be using the same action when throwing the rock at the walkers before falling into the river? Looks like some iOS code. Moving the lighter toward the kindling was at the start of Ep1, with the fire just after the 16 month time gap. When i played it again yesterday my idea is that he just pushed them out of the way. They were in the middle of the alley, and the alley was maybe 15 meters long in total, i mean it's an alley between 2 houses and houses aren't much wider than that. So if they are in the middle of a 15 meter long alley, it's about 8 meters to the end, and form what i saw it's about 6-8 walkers coming straight for him, it's not impossible for some of them to start feeding on Ben, and pushing them out of the way without being bitten is far from impossible. I can't stand firmly with this idea but hey, guess we just have to wait and see, right? The point of that was to underline that what you and others call logic and realism just comes down to a lack of imagination. The ver… morey next sentence is "Even though people survive insurmountable odds every day in real life." Obviously it has to be internally consistent, I just don't consider unimaginative naysayers as good barometers for what is and isn't realistic. Realism does not exclude the unlikely, just the impossible. (and by impossible I mean it can't break laws of physics, not what you and others assert or happen to think is impossible.) Manhole cover, climbed up a wall, got splattered with walker guts like Lee did, that was just off the top of my head, it's really not that hard to find a way. But seeing as you are boring me now and it's getting late, yeah... this conversation IS over. P.S. "How else did he survive then? He flied? Used an invisiblity cloak?" Appeal to ridicule, also a logical fallacy. Learn to logic. Whoa, what the hell? If i'd say who they look like, it would be Vince and Abraham Ford, but to me it still feels like it's just supposed to be placeholders, since the only face we can really see is Eddy from 400 days. Senhor, what software are you using to find all this stuff? I think clem was supposed to lose her hat when she falls to river and dog would find it. That's YOUR opinion, not a hard fact. I'm not a fan of him but some of his videos are ok , just being above watchable. Now, that's MY OPINION. Learn the difference and stop whining. We never saw him die and that's the problem. 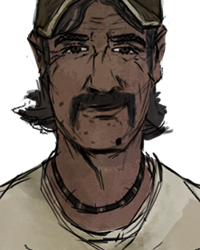 Telltale also pretty much confirmed he is alive by saying that season 2 would "explore Kenny", "It was confirmed that Kenny's fate "will be explored" in Season 2"
How could it be Kenny? idk, but you could clearly see that he couldn't escape in Season 1. Well, can someone explain how it could be Kenny? "OMG WALKER KENNY PLEASE WAAA PLEASE KENNY IS THE ONLY IMPORTANT CHARACTER IN THE ENTIRE WALKING DEAD SERIES. HE HAS TO SURVIVE PLEASE THIS IS FAKE BECAUSE HE'S DEAD EVEN IF IT'S SHOWN IN AN OFFICAL EPISODE WAAAAA"
Just a tip, you are as bad if not worse then the "kind of people" you dont like. I think he meant to say Kenny Thread, and that it is. I don't purposely stalk users just to downvote their comments because of their dislike of a character, I only argue with the diehard ones. I have no problem with normal, proper considerate Kenny fans. It's the fans that make it their mission to make people feel bad for disliking their favourite character and act as a hive mind to converge on that one person. If I had the chance, I'd rather carry it on in a PM, but some people would rather drag the arguement out on the public. I don't want it effecting the rest of the forums. Truly. Well it's not like you are having a real conversation either, if Kenny fans really are like what you mentioned above you are no bett… moreer cause you are doing the exact same thing. 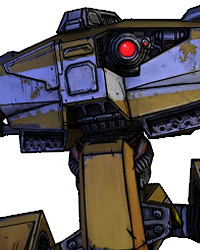 If you want them to treat you better and have decent conversations then maybe you should not go around all Kenny related threads and be all like: "OMG WALKER KENNY PLEASE WAAA PLEASE KENNY IS THE ONLY IMPORTANT CHARACTER IN THE ENTIRE WALKING DEAD SERIES. HE HAS TO SURVIVE PLEASE THIS IS FAKE BECAUSE HE'S DEAD EVEN IF IT'S SHOWN IN AN OFFICAL EPISODE WAAAAA" Just a tip, you are as bad if not worse then the "kind of people" you dont like. So just cause she CAN die, why would that mean she CAN'T appear? Obviously if she lived she could come back. I just don't think that Telltale will bother to bring Molly back for an appearance in season 2 like they won't have Andy St. John pop up if you decided not to kill him. "Next time, on the walking dead"
breaking the 4th wall much, telltale? Andy and his family obviously died at the farm though, that's implied quite heavily. With his brother stuck in the trap, mum dead and him just being heartbroken i dont think he made it out (like many others). Molly was also a character in your group who left. Same argument could be said about Kenny, Lilly or anyone, why bother to bring them back? Molly was part of the group, friendly and loyal, could call her a main character even (although her time was quite short). The big question would be, why not? The only reason i could use as to why they would not make her have a comeback is the odds of it really happening after about 2 years (or what ever the timespan), but same could be said about anyone. 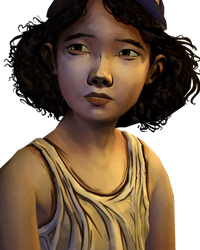 I found a file of clementine saying: "Next time, on the walking dead" breaking the 4th wall much, telltale? You don't know for sure if Andy died, though. If you left him alive he could of avoided the walkers, left the farm behind & eventually found a group. I'm not saying that necessarily happened because he could of very well been devoured by walkers, but there are other possibilities that could of taken place after Lee left them behind. To say he definitely died after you took off isn't an accurate stance to take imo since you didn't actually see a walker attack him. As for Molly, the fact that she can die in episode 4 makes her feel more like a filler character that's only purpose is to help the story move along (ex/ give you info about Crawford) rather than a main character that you run into like Omid & Christa. That's just my opinion, however. Andy and his family obviously died at the farm though, that's implied quite heavily. With his brother stuck in the trap, mum dead an… mored him just being heartbroken i dont think he made it out (like many others). Molly was also a character in your group who left. Same argument could be said about Kenny, Lilly or anyone, why bother to bring them back? Molly was part of the group, friendly and loyal, could call her a main character even (although her time was quite short). The big question would be, why not? The only reason i could use as to why they would not make her have a comeback is the odds of it really happening after about 2 years (or what ever the timespan), but same could be said about anyone. I tried my luck with kenny202, but nothing happend, Lets see, is there more characters you guys think is going to appear? maybey lee in some sort of way, falshback or something, and can u look for molly and lilly please? 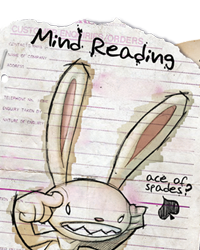 Ive tried my luck again with cheats engine using the string value type and the option to see when the memory was used in the game … more I tried my luck with kenny202, but nothing happend, Lets see, is there more characters you guys think is going to appear? Awwww how sweet, there are developers teaching us how to..make a cutscene? hack the game? throught files you can't acess? "Hey all! So I'm going to write a few notes here which will section the below stuff off and explain where each thing will happen. Hopefully this will make it easier to understand. Extreme apologies to Randy for this mess. Also, fail states will not be mentioned (actually I started this, but I'm not sure I've accounted for them all yet). For what it's worth, this looks much bigger than it is, since most of the interactions we're doing are very simple and granular (grab rock, throw rock, for instance)." I have to say, you are doing a amazing job, seriously this man deserves a applause for all the hard work he is doing in the name of a character, great work! Indeed, a round of applause for Senhorcreeper! You rock, man. 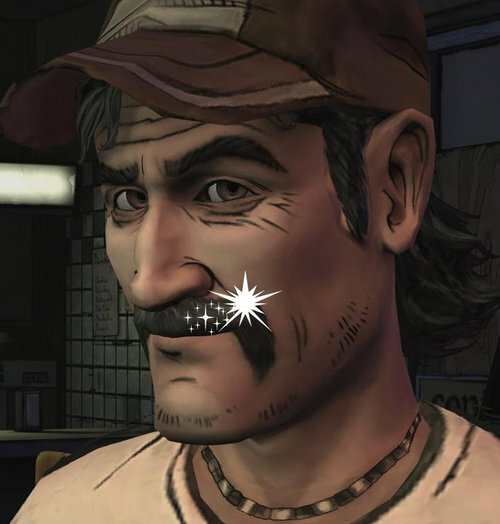 okay, let's just hope that kenny returns and dont die with his godlike mustache!